On 2nd June 2015 The B-Safe Team met for a session at Stanford House, Shaw Park. 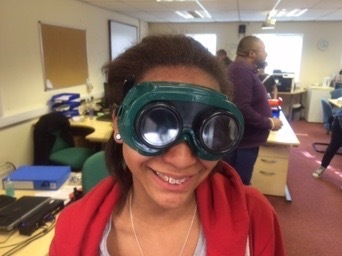 12 young people aged 11-15 attended with Raymond Codner, Hansa Clay and Amelia Chalak from the HeadStart team. Recently The B-Safe Team expressed concerns around alcohol, so we took the opportunity to deliver a few activities covering the effects of drinking. The session started off with a few questions, such as ‘Who has had Alcohol?’ and ‘When did you have it?’ Around 90% of the B-Safe team had tried alcohol, but only at special occasions, where their parents were present. What did the children know about alcohol? 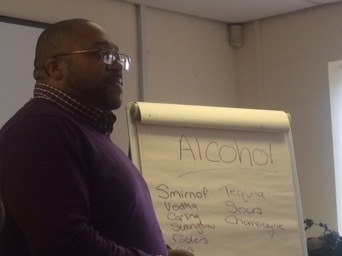 The children were able to name around 17 different types of alcoholic drinks, and described why people might start to drink. Some motivations for drinking included peer pressure, Dutch courage, stress relief, rebellion, to have fun, and just because they can. Did you know that the legal age children can drink alcohol is 5 years old? The team were shocked about that too! They thought it was around 11 years old. At home parents are allowed to give their children sips of alcohol from 5 years old, giving them the control to introduce their children to alcohol as they see fit. In the next part of the session, the children got a chance to see what it was like to be drunk, including the short term effects. They did this not by drinking, but by wearing different types of goggles, night-time and day-time. They were able to see what it would look like after having around 4 pints of lager. To make this a little more interesting, we then set up three different activities to try, whilst being ‘drunk’. In the first they had to walk in a straight line that had been marked on the floor without losing balance. In the second they had to attempt to tie their shoelaces, as well as catch a ball and read an eye test. In the third activity, they had to play a game of bowling. 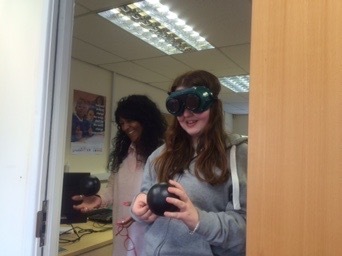 The young people responded well to all three activities and found it both amusing and interesting. These were just simple activities, that would be easy for a person who had not been drinking, but with the added alcohol, and what it would look like, the children felt it was a challenge. We feel it was a real eye opener to the team. When we asked what they would come away from the session with, most people said they would not drink, but of course as soon as they turn 18, it’s what they will want to do. The HeadStart team reassured them that this was ok, but make sure they were sensible and not alone. Overall the session was a success, and the children had fun around a quite dangerous and serious subject and came away knowing they had to be very careful. Here are some key links to alcohol resources in the UK. 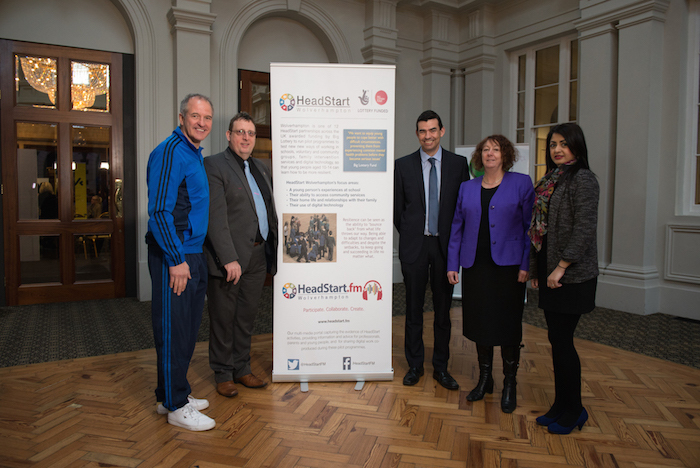 After a novel bidding process that involved the use of our HeadStarters as Dragons on judging panels, HeadStart Wolverhampton is pleased to formally announce our 12 funded projects, which spread across our strands to support resilience in young people in a variety of innovative ways. We had so many great applications that we decided to make savings elsewhere in order to increase the number of projects we could support. Keep an eye on our strands pages and on our social media accounts for regular updates from these projects. This project will aims to see young people overcome the significant challenges in their lives and flourish, feeling positive about themselves, their relationships with other and their futures. The project will reach some of the city's most vulnerable young people outside of mainstream education and disengaged from 'normal' channels of support and advice. 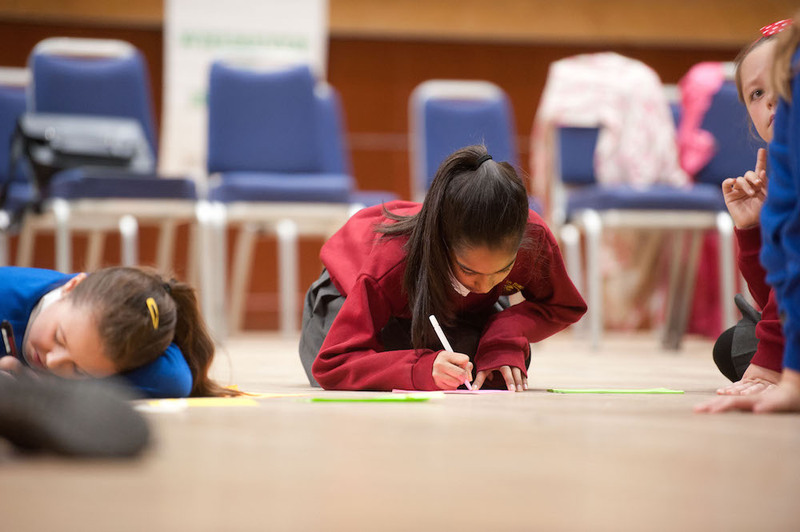 Working with girls between the ages of 10-14 who are disengaged,this project aims to address trauma and the consequences of trauma, improve emotional resilience and ability to cope with day to day challenges, address challenges behaviour patterns linked to traumas remove barriers to engagement. Working with vulnerable young people identified as being on the entry point of Youth Justice system, this project will use various mechanisms to build resilience and coping mechanisms in order to avoid this behaviour escalating, reducing first time entrants into the Youth Justice system. This project will build resilience in lesbian, gay, bisexual, and transgender (LGBT) young people and increase awareness of X2Y youth group. engage young people in developing resources that will increase self efficacy and reduce risk for LGBT young people in the future. This project helps parent and carers to understand the things that impact upon a child's resilience, and to affect positive change in their own interactions and relationships, as well as to build parents/carers own resilience, which in turn will have positive impact upon children's resilience and behaviour. This project aims to build capacity, develop resilience and ultimately enable parents to better support their children and themselves. The project consists of eight 4-week programmes and a monthly support group, as well as eight 'green space' family sessions in school holidays. 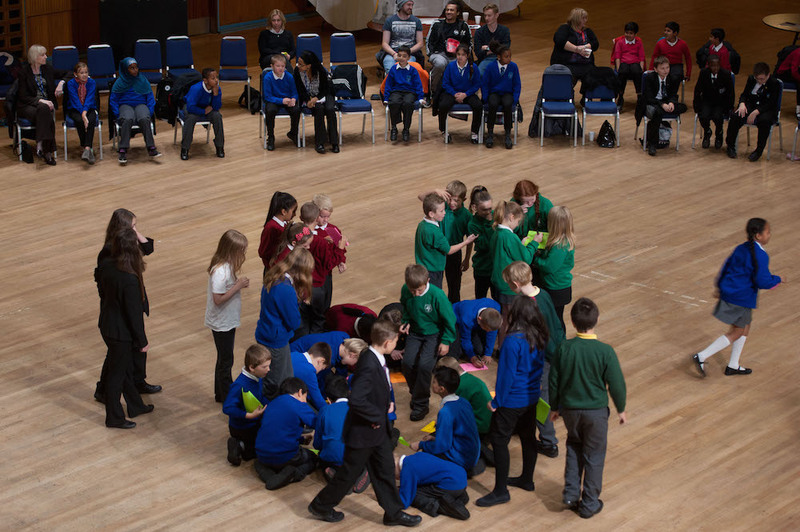 This project builds on existing work with pupils using SUMO to develop emotional resiliency. The project brings SUMO to parents and carers from vulnerable families to develop their emotional resiliency, understand the SUMO principles and philosophy and understand the resilience work children are involved with at school. This project supports parents and carers to become more confident in their role and better equipped to support their child's development. 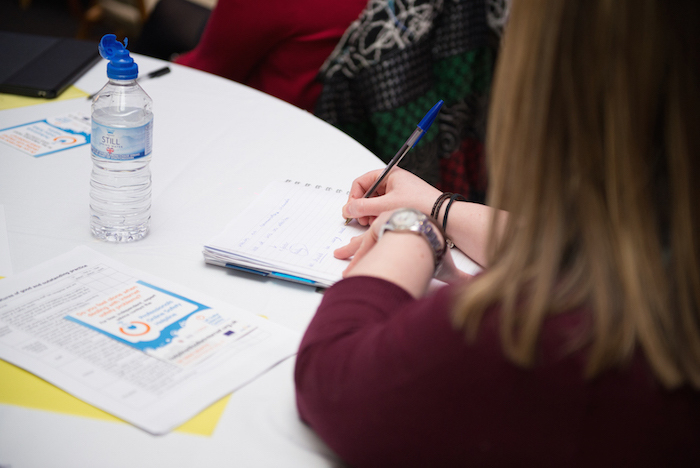 Participants will learn techniques for coping with parenting and gain a greater awareness of influences on their own health and wellbeing, gaining an understanding of where to go for help and advice and widen their social circle. This project engages young people in positive activities based around bikes, providing a supportive framework that will help develop coping strategies, confidence and self esteem by working and learning from adult/peer mentors to become more resilient in coping with life, with an element of creativity around fixing bikes. This project promotes interest and participation in arts and crafts among children and young people. Additionally the festival raises awareness of and celebrates the artistic talents of young people and supports young performance. 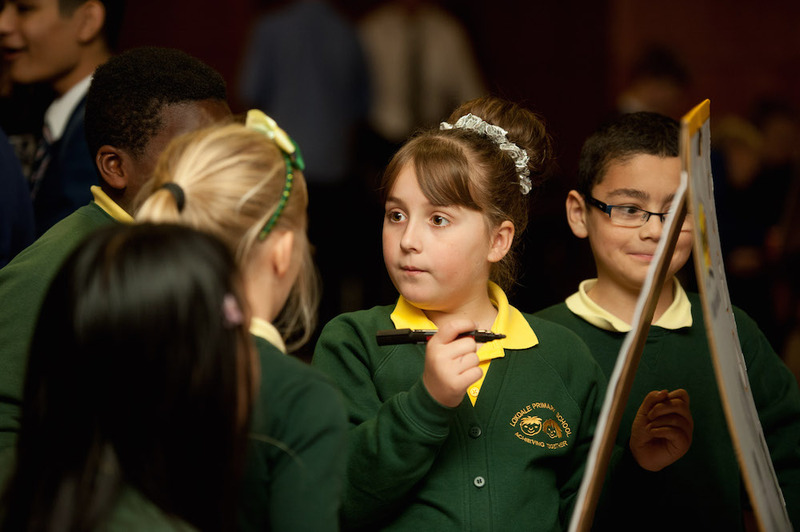 These activities reduce loneliness and isolation, promote diversity and showcase talents.. 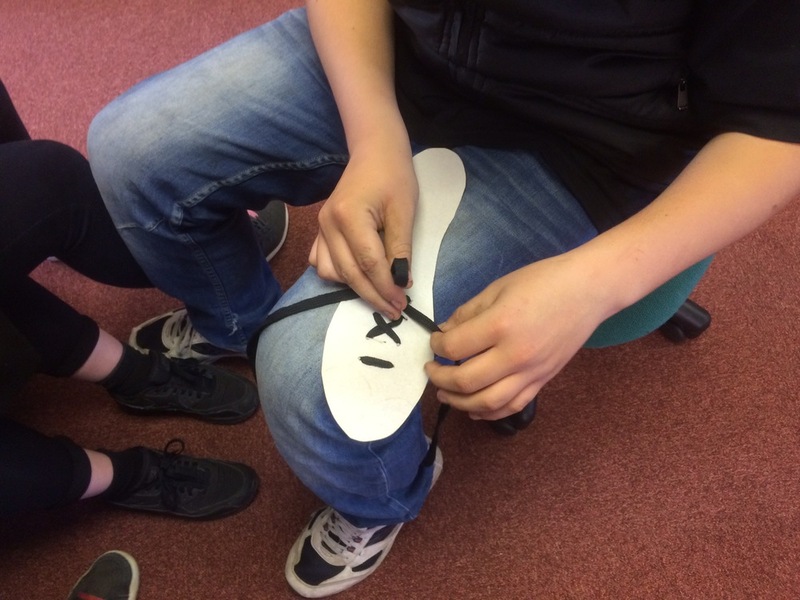 The aim of this project is to enable young people to develop the skills they need to manage difficult situations they experience or may come across as they grow up, supporting self-esteem, emotional resilience, a wider network of trusted adults and peers and better access to enjoyable activities that support their hopes, needs and aspirations. This project engages young people in radio and media activities to improve their mental wellbeing, reduce isolation and enhance their future prospects through confidence building. Increase awareness of mental health issues and improved access to support through links to our partners. 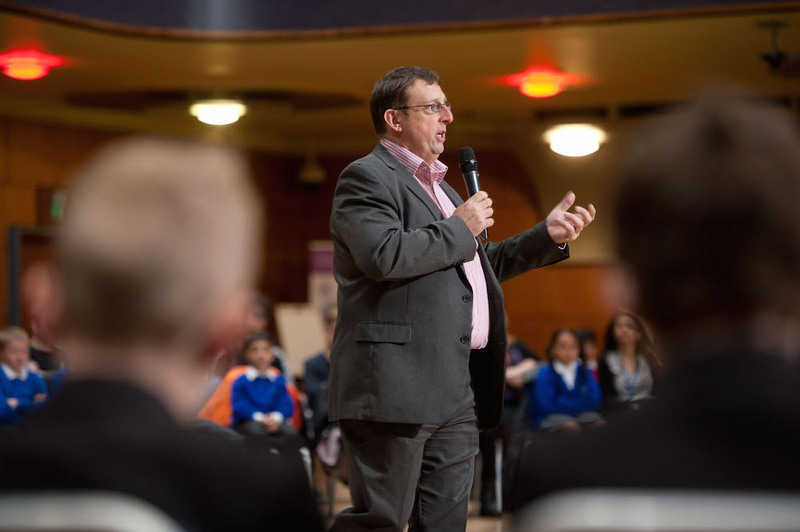 On 10th February, 110 young people and over 50 professionals, including school teachers, senior leaders and governors, came together at the Grand Station in Wolverhampton for a day of thinking, learning and inspiration to mark Safer Internet Day 2015. 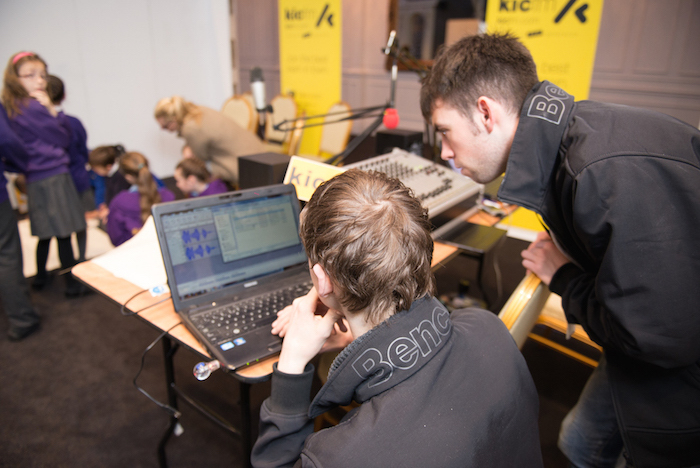 The day was part of the city's Safer Internet week, which also saw many schools exploring the issues in class, and an awareness raising campaign on KicFM. 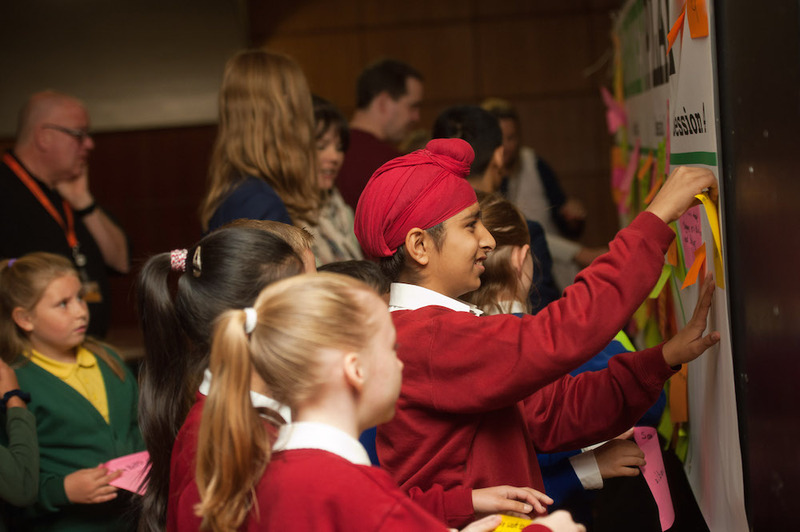 The Safer Internet Day conference was a partnership initiative funded by HeadStart, Wolverhampton Safeguarding Children Board and the Learning Technologies Team. 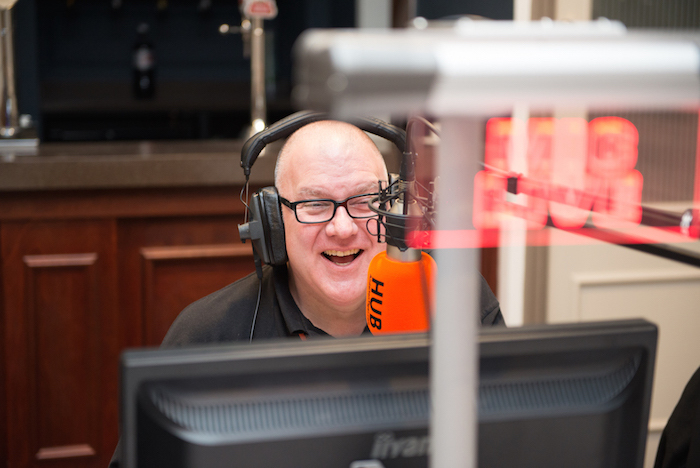 Russell Prue of Anderton Tiger broadcast live from the venue all day, and recorded a number of great interviews with attendees and session leaders. 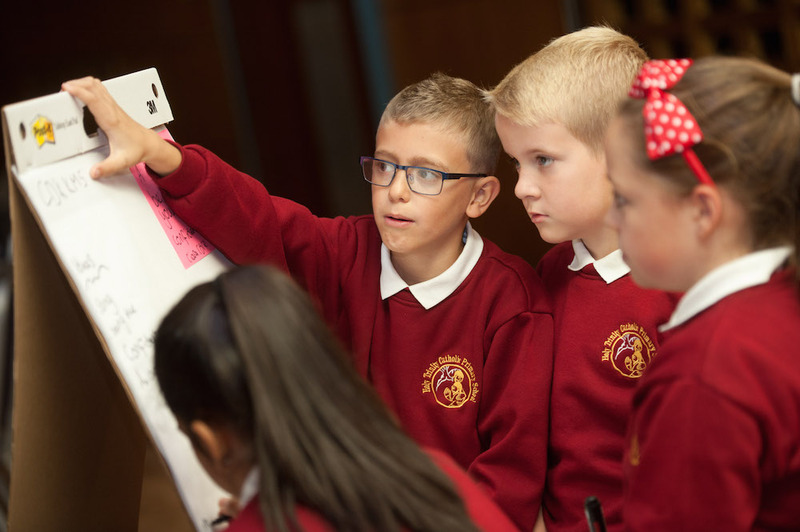 The professionals at the conference participated in workshops and presentations from the police, the Learning Technologies Team and national digital safety expert Simon Finch from Northern Grid for Learning. The conference was opened by Councillor Val Gibson, Cabinet Member for Children and Families on Wolverhampton City Council, and by Alan Coe, Chair of Wolverhampton Safeguarding Children Board. 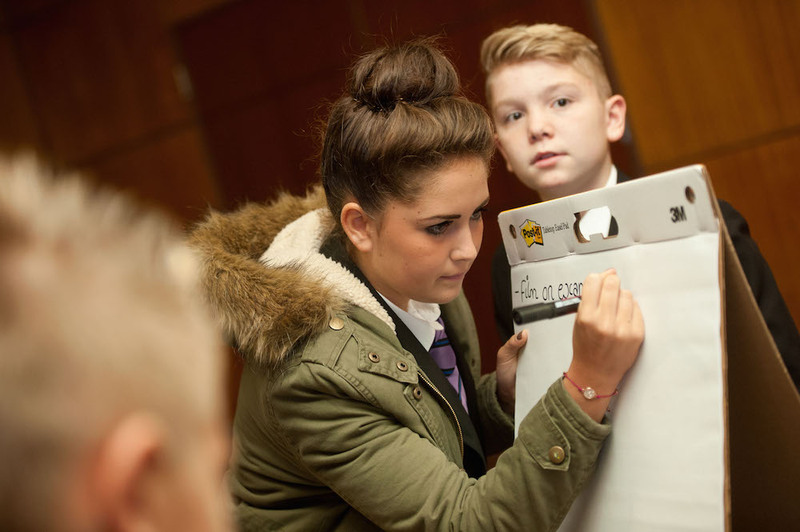 In a neighbouring room 110 young people, aged between 8 and 16, attended the B-Safe Event. 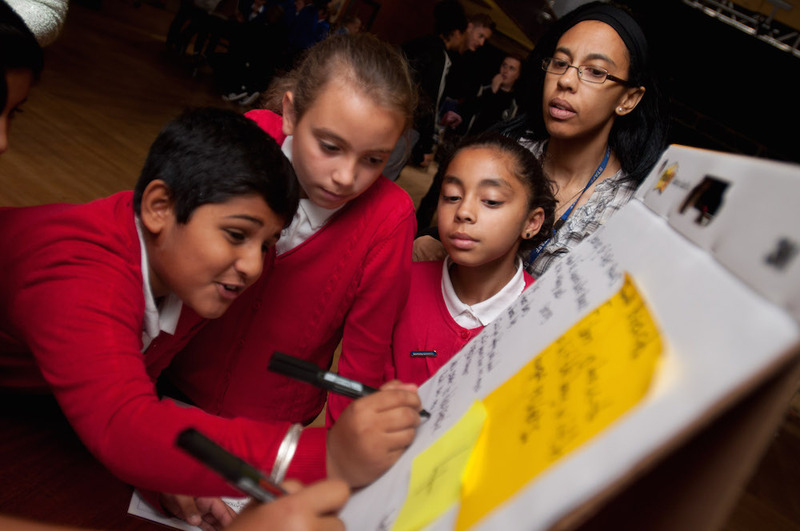 The students came from 18 of the city's schools and alternative providers, and participated enthusiastically in workshops with the police, the Learning Technologies Team, the Central Youth Theatre, KIC FM and the Healthy Schools team. 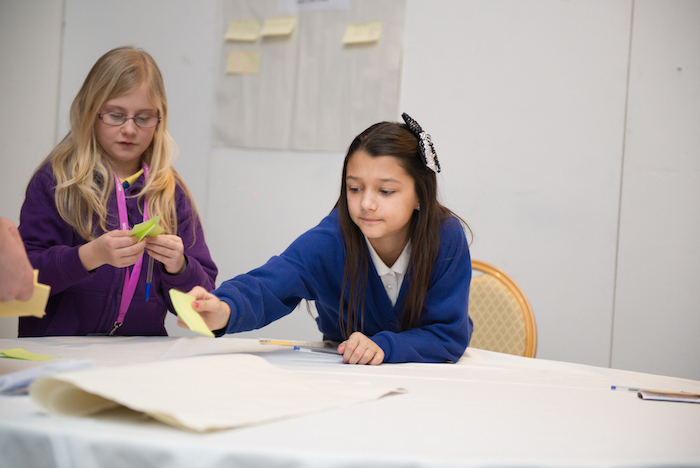 The workshops helped the students to explore the important themes of online safety, privacy and encouraged them to think carefully about their own online behaviour, supporting them in making the best of the incredible opportunities of the internet while keeping themselves and their friends safe. The young people also had the opportunity to pop into the 'diary booth' to record their experiences and answer some questions on safeguarding and e-safety as part of a survey being carried out for the Safeguarding Children Board. 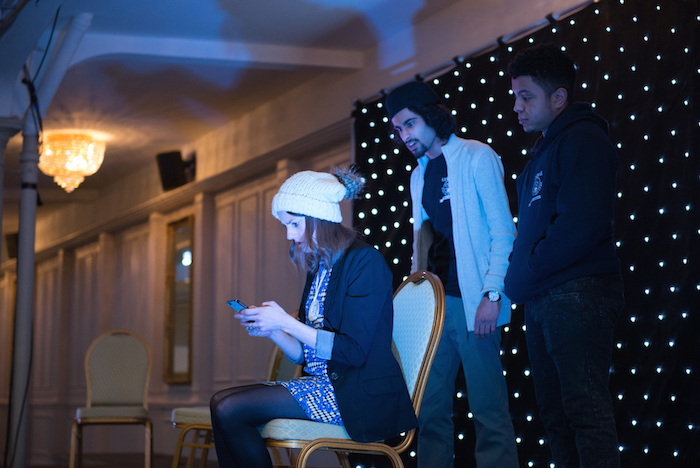 The B-Safe event was closed by a thought-provoking drama on cyber-bullying from the talented young actors of the Central Youth Theatre. 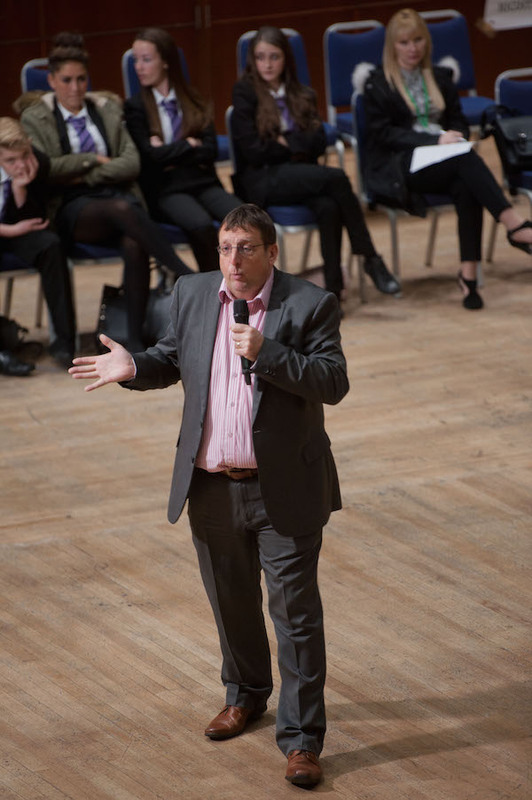 Simon Finch was the afternoon speaker to the young people, and involved the young people in a lively discussion about the digital world and their attitudes to online privacy, social networking and conducting relationships online. 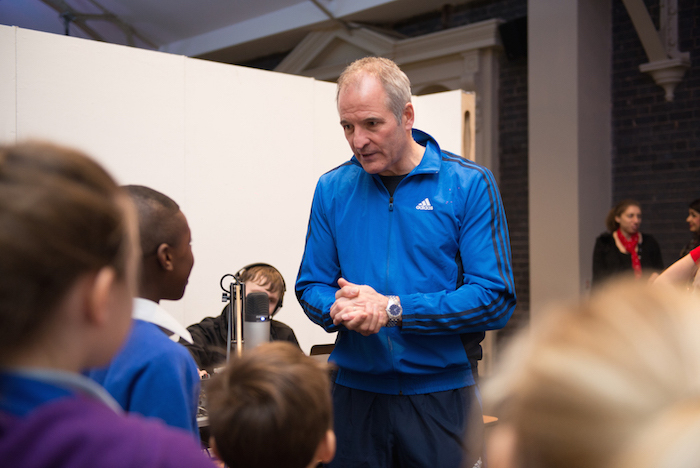 Wolves legend Steve Bull dropped by to be interviewed and to meet some of the young people and the professionals and to lend his weight to the key ideas being explored. 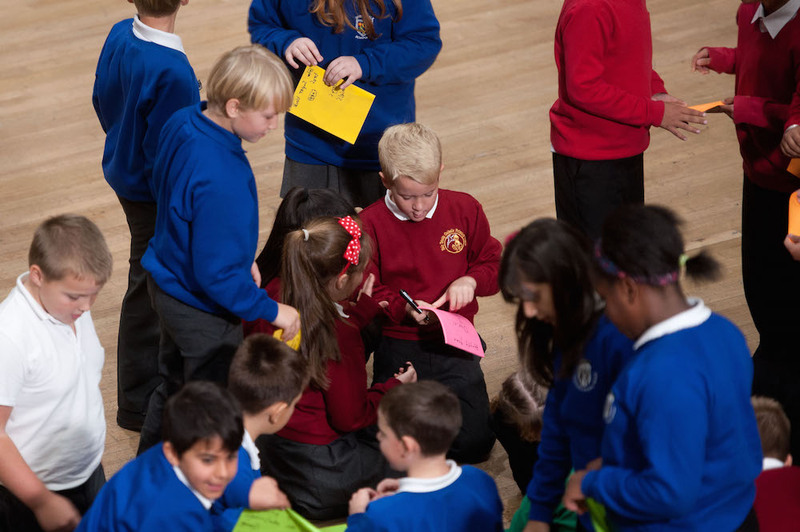 The successful Safer Internet Day event supported us handling ourselves personally and professionally in this modern era of online communications, commerce and digital creativity. We look forward to future similar events, as the work of educating young people in making good decisions about their online activities continues. 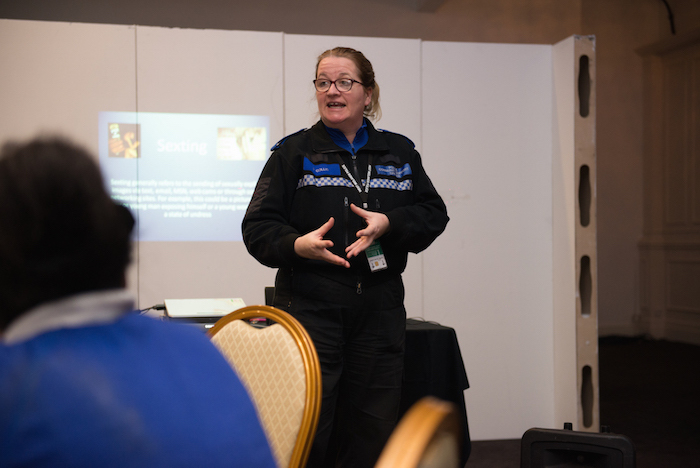 “Thanks for inviting our young people to a fantastic event, we are going to be doing more work in school on online safety and feel now some of our young people are more educated on staying safe online”. “Just to say a big thank you for the event today, The students and staff came back absolutely buzzing. They really loved the day and can't wait for the next event”. "it was brilliant. I learned so much about the dangers of online safety"
"I wish we could do more thing like this, it was great working with the police and the other adults"
"I didn't realise that it was against the law to do some of the things that young people do all the time online"
"Central Youth Theatre were amazing. It was great to do drama as a way of acting out bad things that could happen"
"It was a fantastic day. When is the next one?" 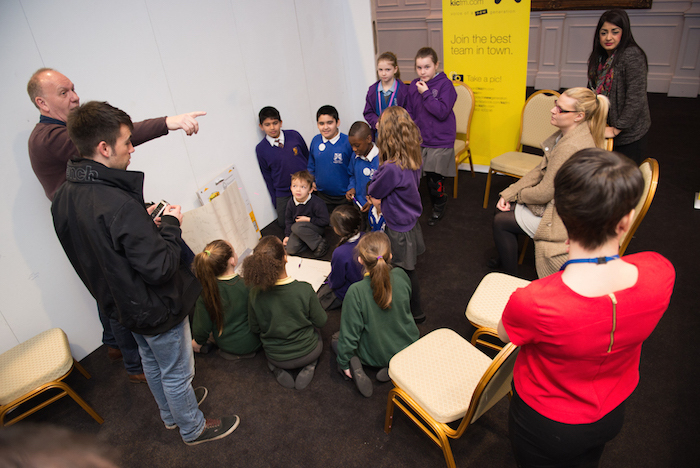 As part of the digital technologies strand of the Wolverhampton HeadStart pilot, over 100 young people from primary and secondary schools around the city were brought together at Wolverhampton Civic Hall for an "Open Space" day. 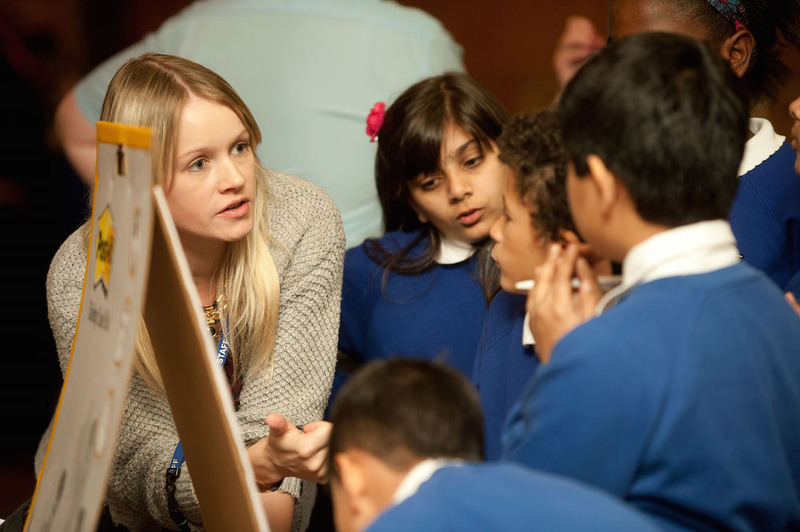 During the day, the young people collaborated with one another and with industry professionals to formulate ideas for digital projects in schools. What is an Open Space meeting? An 'Open Space Technology' event is a method of holding a meeting where the participants set the agenda and get to speak about the ideas and topics that interest them. All the ideas are placed on a large agenda board called the 'MarketPlace' and participants can then visit the topics that interest them. Alternatively they can be 'bees' or 'butterflies' and move around multiple topics, cross-pollinating ideas and contributing as much as they wish. Our Open Space was facilitated by Karl Royle from the University of Wolverhampton. Karl has hosted and participated in many Open Space events, but never one that consulted children in this way. 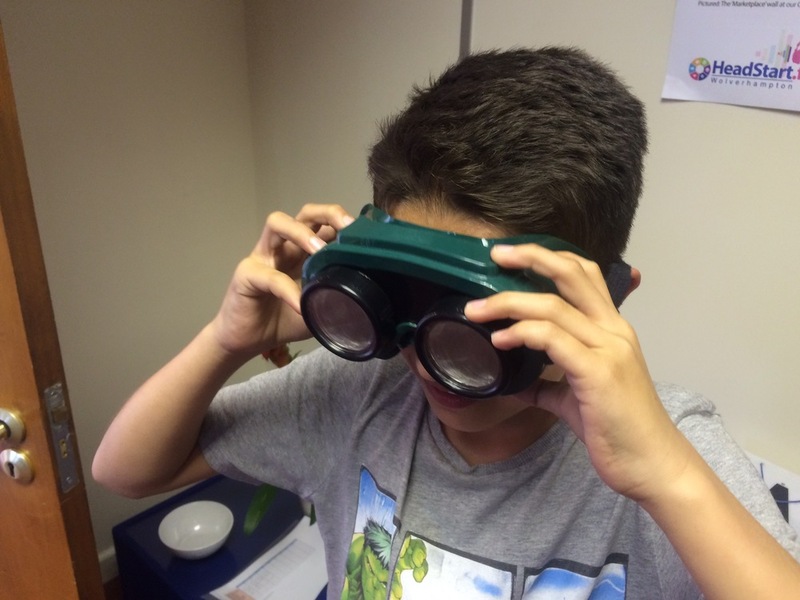 The passionate Open Space community online were very impressed with the children's effort in this technique which is normally used by businesses and large organisations. 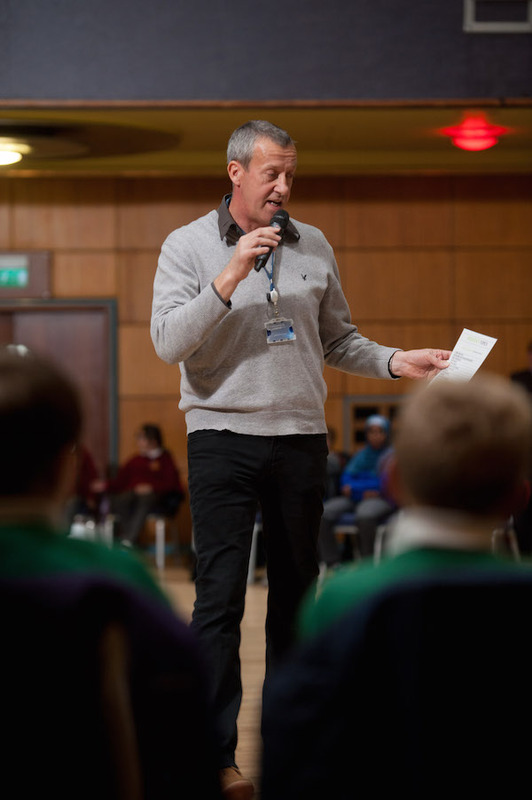 HeadStart Programme Manager Kevin Pace introduced the day by telling the children a story about three young people he knew at school and how each reacted to the same situation in very different ways. This helped the children to begin thinking about the various aspects of resilience and mental health in a way that they could relate to. Karl Royle then talked the children through the process and structure of an Open Space event. 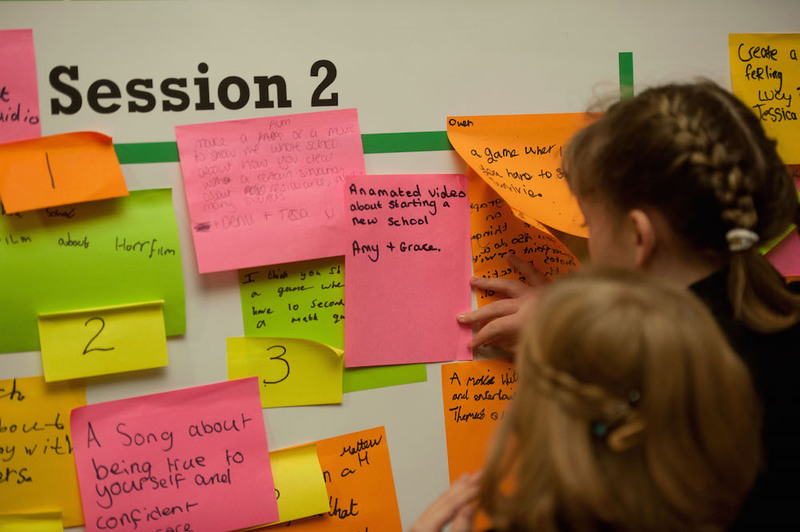 The children were then invited to come to the centre of the circle, write their ideas onto large post-it notes and stick them up on the MarketPlace agenda. The children showed no sign of holding back and began running to the centre of the circle, many returning several times with new ideas. They were tasked with generating ideas for creative projects, such as apps, short films, music projects, radio shows and games, around the various themes of resilience. For example, a radio show about bullying. A radio show about bullying, notably featuring celebrity guests giving their personal stories and linked to hashtags online to generate discussion and engagement. An app or web portal for seeking guidance and help with a variety of issues, including a helpline, discussions and articles. An animation dealing with the issues faced when starting a new school. A catchy, upbeat song to cheer people up. A behind-the-scenes style documentary into the lives of people with disabilities. A film that can calm people with anxiety issues. An animation dealing with unfairness. 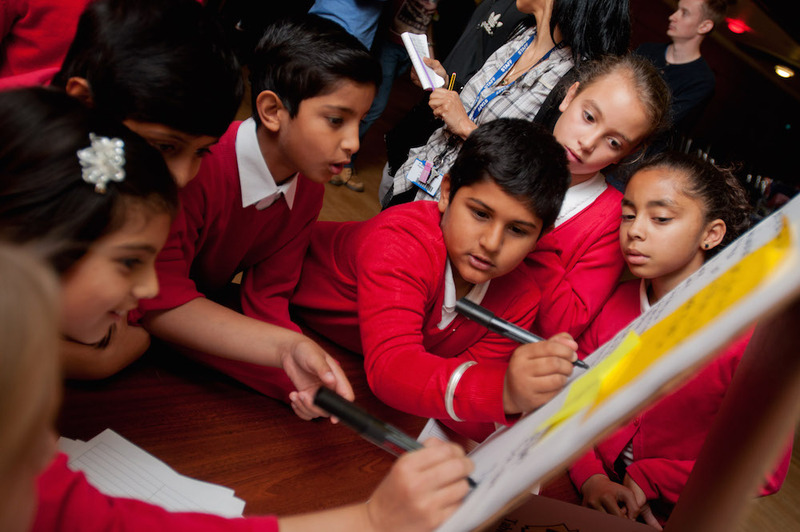 The HeadStart team are now processing all of the ideas and communicating with various creative professionals around the city who will be going into schools to complete the projects. Watch this space for a full list of the ideas that are being taken forward. Thanks to the following local professionals and partner organisations that were present on the day to support the children and help to develop ideas.